Mt. 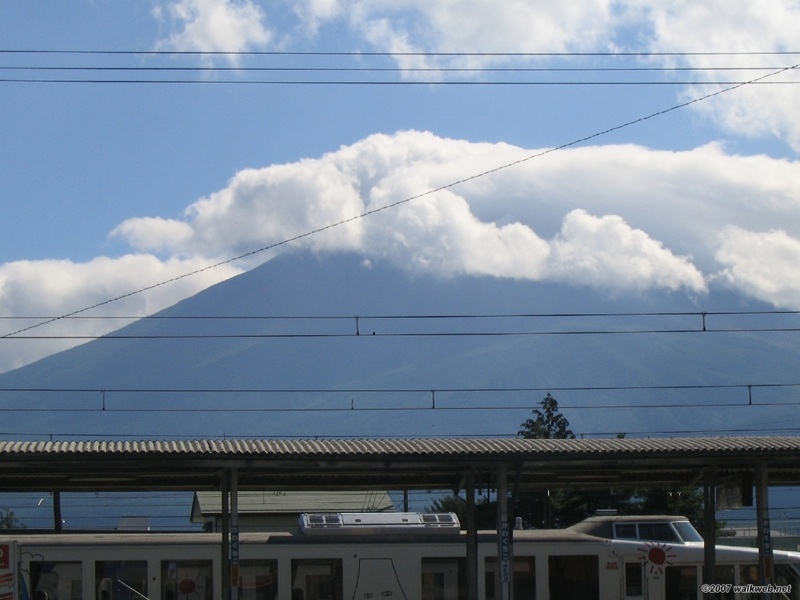 Fuji, a sacred mountain, stands at 3,776 m (12,388 ft) high. 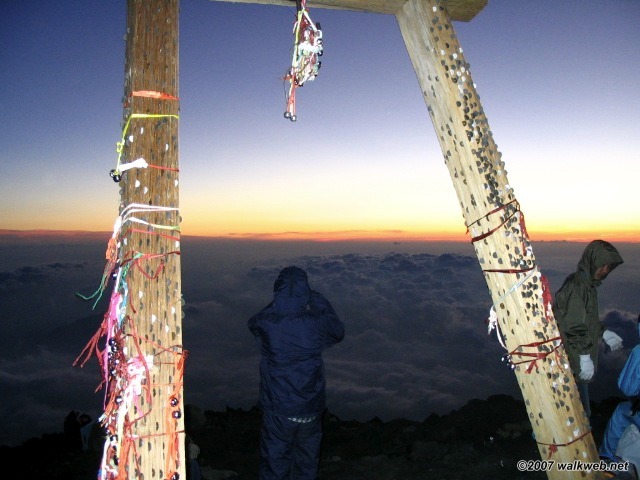 It is Japan’s highest and most prominent mountain and the second highest single mountain in the world after Mount Kilimanjaro. The official climbing season is between 1 July and 27 August during which the mountain tracks become extremely busy and sometimes heavily congested with thousands of hopeful pilgrims attempting the climb. 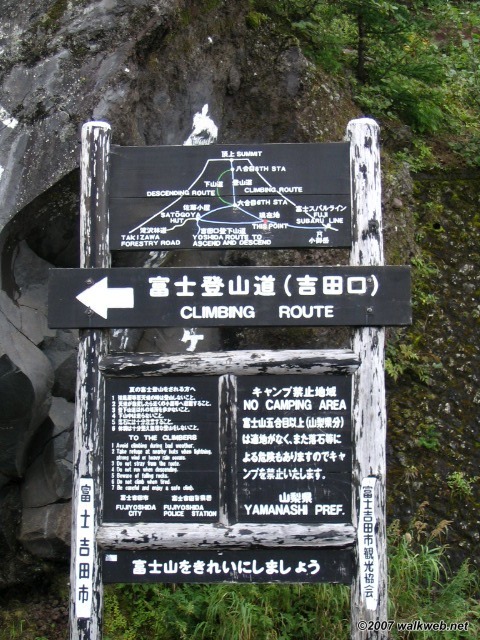 During the official climbing season one can board a bus in Shinjuku and travel directly to the 5th station (Yamanashi Prefecture). To get there out of season I caught the regular bus from Shinjuku to Kawaguchiko Train Station and then a local shuttle bus to Kawaguchiko 5th Station. Also as a result of limited bus access and a 2.00 pm arrival time a decision had to be made to stay on the mountain overnight. This was no problem and was in keeping with my plan to experience the sunrise from the summit. Alternatively a later start and a night climb would have been a viable option. Despite all the dire warnings I had read on various web sites about the appeal and cost of using the various huts on the trail I wanted the opportunity to stay in a Japanese hut to compare it with those experienced in the European Alps. I have to admit that the warnings were accurate and in my opinion a nights stay at one of these huts bears no comparison to the level of comfort or value found in their European counterparts. However it was a memorable if somewhat uncomfortable experience. Starting on the trail at 2.00 pm there were few people around once I left the confines of the tourist shops and restaurants at the 5th Station. The track was reasonably easy going, zigzagging it’s way upwards with a few sections of rocky terrain protected by wire rope or chain. As one got higher the incline of the track became steeper but was not technically difficult. Thankfully although somewhat chilly there was little wind. The prospect of walking up paths surrounded by slopes covered in loose volcanic ash and fine sand would have been somewhat uncomfortable in even a modest breeze. During the afternoon I met a few other climbers taking shelter at the various rest stops along the way. Most of these facilities were all securely locked and battened down for the winter period. Arriving at the Real 8th station at about 16.30 hrs I was running out of options where to stay so opted for a hut at this level that was still open and paid to have a meal and stay the night. I was shown to where I was to spend the night in a typical matratzenlager style dormitory and was then given a plate of unidentifiable brown curry and rice followed by several cups of welcome tea. After an uncomfortable night an early start at 03.30 to set off for the summit was not such a big deal despite the lack of sleep and advancing years. Still at least I hadn’t needed to buy a can of instant oxygen to survive! Leaving the hut that morning it was quite a surprise to see the increased numbers of people making their way upwards in the dark, lamps shining, heads bobbing around like fireflies. A number of groups had made it up during the night and were straggling in line behind their leaders who were carrying poles with lights on the end and shepherding them ever upwards and shouting words of encouragement. As the track meandered on it was evident that a few people were showing signs of distress both from over exertion and also lack of oxygen. Sensibly their companions were either letting them rest or taking them down the trail to a lower altitude to recover. Looking around as the sun begins to rise and the colours in the sky become more intense the real magic of the occasion becomes apparent and the effort involved in climbing this iconic mountain is amply rewarded. After watching the sun appear fully on the horizon it was time to go down I had achieved my goal. The decent is reasonably straightforward providing one remembers to make sure to follow the Descending trail after the Edoya Hut and not to try and go down the Ascending route. I was back down at Kawaguchiko 5th Station in about 3 hrs and had a celebratory breakfast consisting of a plate of freshly prepared gyoza and a can of Mt Fuji beer! Unfortunately being dependent on local transport a tedious few hours had to be spent waiting around before returning to Kawaguchiko train station to retrieve my luggage from the lockers there and continue on my journey to Kyoto. 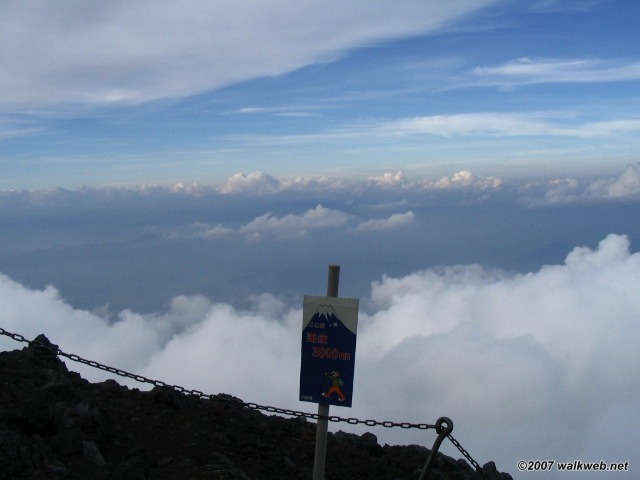 Needless to say climbing Mt Fuji is a serious undertaking despite its popularity and this is particularly so out of season when most facilities on the mountain are closed. Normal precautions should be taken for climbing mountains of this altitude and suitable clothing and equipment must be carried. Also in retrospect I should have carried a more varied supply of food and drink. 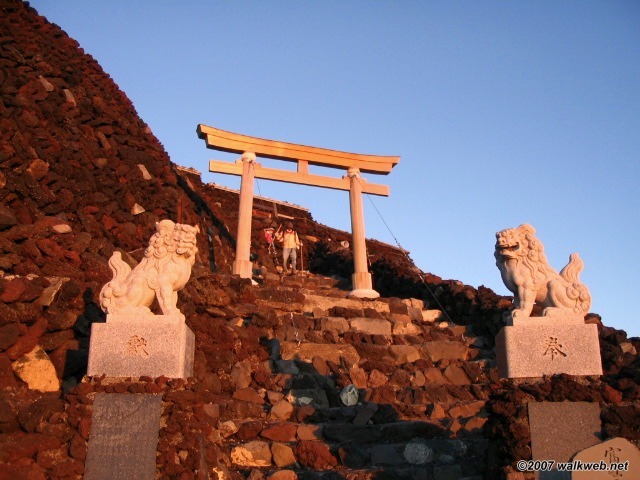 Given the opportunity to do the climb again I would still go out of season but do the whole trail starting from the Kitaguchi Hongu Fuji Sengen Shrine (850m) with arrival time at the summit to coincide with sunrise and then descend to Kawaguchiko 5th Station and take the bus. We are looking at climbing in early September 2008. Was there any guide to what facilities were still open at this time? I have the same question as Lissa. Your description of your climb was very interesting. You indicated that you made your clim in early September of 2007, I assume you climbed between Sept. 1st and the 10th? Do you know how far into September some of the huts remain open? How many huts were opened. Thank you for a very informative artical. I await your reply. 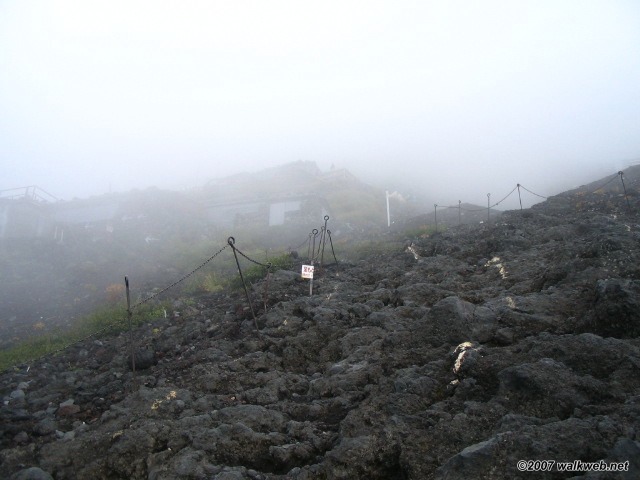 All the facilities at the 5th Station were operating normally as tourists were still visiting in September. So food, drink, souvenir shops. post office and tourist information etc were all available throughout the day. My biggest problem was due to relying on public transport to get there and back so timing became critical. 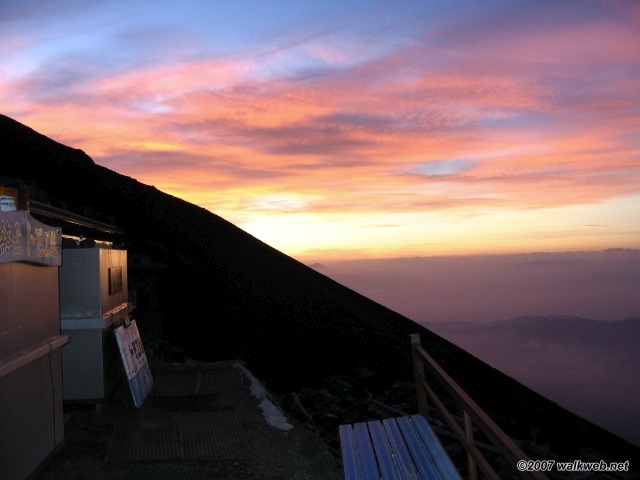 If one has independent transport then there would be no problem and you can chose when to leave for a night climb if you want to experience sunrise and avoid stay at one of the huts. Only a few of these were still open at upper station levels, however details are shown on the first web site above. Suggest you don’t rely on them for food and drink, carry your own. Depending on the weather however you may decide the shelter they provide is worth the cost. There is really nowhere else to go, you cannot camp or ‘bivouac’ and it did get quite chilly during the night. Quite a number of guided groups were climbing the mountain during the night when I was there so I doubt you would be on your own if you decide to do this. 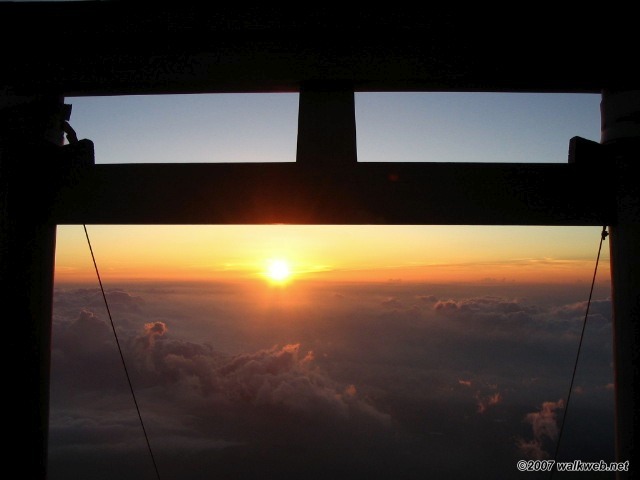 Of course you can just climb up and down during daylight hours but I believe you would miss out on a great experience not seeing the sun rise from the summit. I came across your 2003 request for bio info on Lily Payling on the http://www…by chance…if you are still interested and haven’t seen this one, there is a full page article on her (including a good pic) in the British Australian and New Zealander of 30/8/1930, p. 27, if you can get hold of a copy (the BANZ is held at the State Lib of Victoria I gather). The article is fairly superficial, but it briefly outlines her career to that point, and includes what I gather are extracts from various critical articles which appeared in the British press.